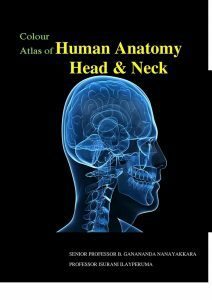 Colour Atlas of Human Anatomy – Head and Neck is designed to provide an understanding of the human head and neck region for undergraduate and post graduate students in Medicine and Allied Health Sciences. It is a practical guide in the dissection theater to unfold the position and relations of the structures of the head and neck. Despite many Anatomical Atlases currently available, there appeared to be a need for an Atlas which compliments the Cunnigham’s Manual of Practical Anatomy, which is widely accepted all over the world as a standard anatomy text. This Atlas was conceived with the intention of fulfilling that need. Colour Atlas of Human Anatomy – Head and Neck follows the Cunningham’s Manual of Practical Anatomy (Volume 3). It consists of sequential photographs taken at various stages of dissection of the head and neck region. Hence the photographs allow side by side comparison with anatomical structures encountered during the dissections. In this way, we hope to bridge the gap between description of the text book and what students see in the cadavers. All photographs are completely labeled for the ease of student’s comprehension and identification of salient anatomical features on dissected specimens. Specimens are labeled enabling students to carry out self-testing of their knowledge.